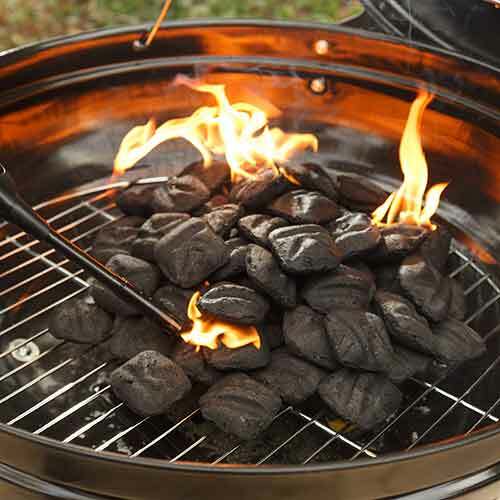 Light grill using Kingsford® Charcoal with Sure Fire® Grooves. Combine ¼ cup olive oil, coffee and chipotle chile in bowl. Place steaks in bowl to marinate for 30 minutes. Wrap garlic cloves in small piece of aluminum foil. Place in fire; roast for 15 to 20 minutes, or until the garlic feels soft. Use tongs to remove from fire. Coat potatoes and red peppers in remaining olive oil. Season steaks, potatoes and peppers with salt and black pepper. Grill steaks, 6 to 10 minutes each side or until desired doneness. Grill potatoes and peppers for 6 to 10 minutes, or until cooked through. In a coffee grinder, purée roasted garlic and one red pepper half until smooth. Transfer mixture to a bowl and add mayo, goat cheese, lemon juice and cilantro; mix well and season to taste. When the steaks and potatoes are grilled, divide onto four plates. Julienne grilled red pepper for garnish. Top each steak with 2 tablespoons of goat cheese sauce aioli.